All-in-one power supply, CPU, and I/O main unit. Built-in features include high-speed counters, positioning outputs, Ethernet, and SD card slot. I/O modules are available with and without built-in power supply and in various input / output configurations. Options for analog inputs and outputs. 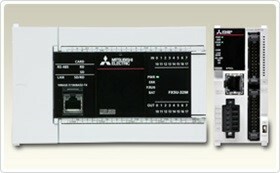 FX3 series analog intelligent function modules can also be connected. RS-232, RS-485, RS-422 communication modules. FX3 series CC-Link master module can also be connected.